This letter was written by Pvt. 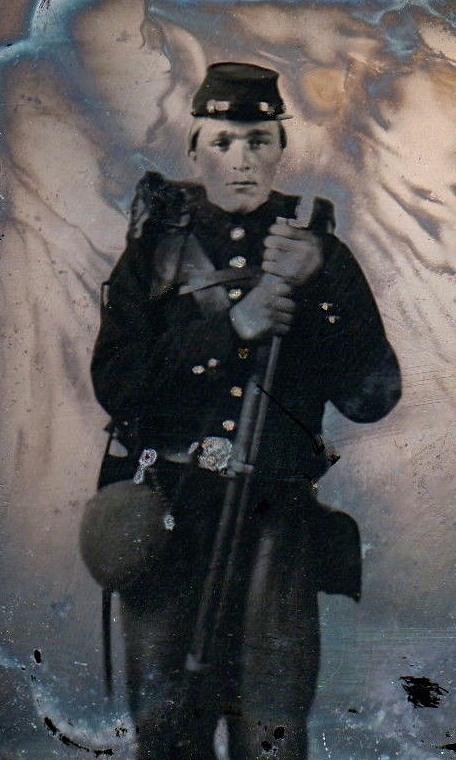 Edgar A. Warner (1841-1863) of the 126th New York Infantry, Company K.
Warner was born in Hopewell, New York, and by occupation was a farmer. He enlisted 31 July 1862, aged twenty-one years, and was in the battles of Harper’s Ferry, Gettysburg, and Auburn Ford before being mortally wounded in the Battle of Bristoe Station on 14 October 1863. Pvt. Warner was taken to 2nd Division Hospital in Alexandria (in a Baptist Church) where he was treated for a gunshot wound to the lungs but he died on 16 October 1863 and was buried initially in Alexandria National Cemetery, Section A, Plot 1014. It seems that his body was later exhumed and probably returned to his home in upstate New York (see comment below). Edgar was the son of Calvert C. Warner (1821-1897) and Eunice V. Latting (1823-18xx) of Canandaigua, Ontario County, New York. Calvin was a miller by trade. 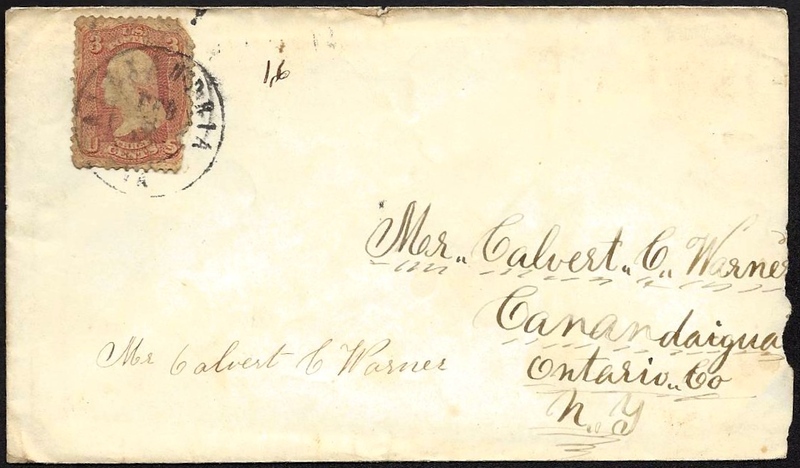 Edgar wrote this letter to his parents as well as his sister, Caroline E. Warner (b. 1845). I received your kind letter of the 26th and was glad to hear that you were well. I have got over the mumps now and will be able to go on duty tomorrow. They have taken Jeff Moore ¹ to the hospital again. He warent quite well — not so as to be able to do duty. The doctor thought he had better go to the hospital and stay a spell longer. I don’t think father had ought to lose that waggon and pay the note besides. I should think Saxton ought to be satisfied with that. Father can do as he has a mind to about it. I have got plenty of good clothes and three pairs of socks. You may send me a pair of boots if you want to. I will want nines, I guess. If you can get ki__ with three soles on if you can get them, and good long legs. Father can tell about what I want by trying them on. Julia said you was all anxious to send a box so I wrote to her and told her to send it along. I am going to send both letters Monday. The mail don’t go out today. You may send me some tobacco chewing and I don’t care what else — whatever you have got to send. I have wrote the directions in Julia’s letter. This is all I can think of this time for my stock of news has all run out. ¹ Thomas Jefferson (“Jeff”) Moore enlisted in Company K of the 126th New York on 12 August 1862 at Canandaigua to serve three years. He was taken prisoner on 15 September 1862 and paroled the following day at Harper’s Ferry when the entire garrison surrendered to Stonewall Jackson’s men on their way to Antietam. We learn from this letter that Jeff was seriously ill in early February 1863; he died of “lung inflammation” on 10 April 1863 at the Fairfax Street Hospital — a former hotel called the Mansion House — in Alexandria, Virginia. This entry was posted on Sunday, May 18th, 2014 at 11:01 pm	and posted in Uncategorized. You can follow any responses to this entry through the RSS 2.0 feed. Thank you for posting this photo request. I’ve been researching Alexandria National Cemetery for several years, and spent quite a bit of time this week researching the grave of Pvt Edgar Warner, Co K, 126th NY. He died at age 35 on October 16, 1863, at 2nd Division General Hospital in Alexandria (in a Baptist church), of a gunshot wound to the lung. As was customary, he was buried the following day. Although he was certainly buried at Alexandria National Cemetery, he does not currently have a marked grave there. My guess is that his family removed him from the cemetery and took him for burial back home in New York, but I checked the two main sources and did not find a record of removal. Do you know where he lived before the war? That might help us find out if he was moved to a cemetery back home. My understanding is that Co K of the 126th was raised in Ontario Co, NY. The closest match I found for name and age was for a farmer in Unadilla–which is not in Ontario Co. 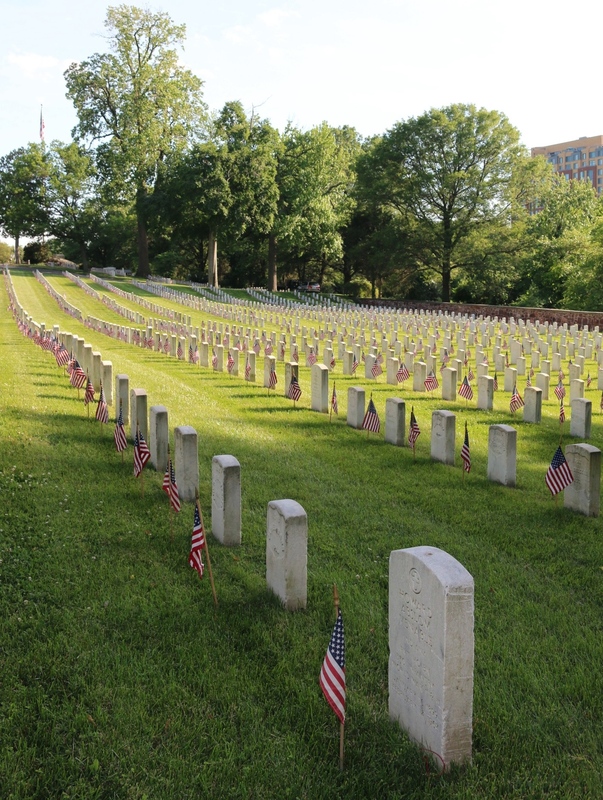 The attached photo shows row 13 of section A, where Pvt Edgar Warner was buried. His grave was originally numbered 1006 but, like most graves in this cemetery, it was renumbered. The newer number was 1014. There is no longer a grave 1014. The grave at lower right is grave 1013-A, and it is where grave 1014 probably used to be. If you look closely, you can see that the stone for 1013-A is of a newer style than the Civil War era stones next to it. The man now buried in the gravesite, Howard Venable, died in 1967. Alexandria National Cemetery is one of the earliest graveyards in our national cemetery system. Many graves were moved within the cemetery, but most of those have markers. In addition to me, two other people have looked for this marker in recent years: historian Wesley Pippenger, who listed it as “not found” in his excellent Tombstone Inscriptions of Alexandria, Virginia, vol 5. More recently, Find a Grave member Stan Jett completed his long-term project of making sure that every marker at this cemetery had a photo pasted on Find A Grave. May I help you further? Please let me know. I’ll note this issue on Find a Grave and remove the photo request, since there’s no marker. In my opinion, the memorial should stay up unless a record of a different grave is found. I wish you a blessed Memorial Day. Thanks so much for this. The Warners are among my wife’s ancestors and finding this information has been very interesting and very helpful.